So, I joined a baking club – Heavenly Cake Baker. A group of baker that came together to bake all of the recipes in Rose Levy Beranbaum book, Rose’s Heavenly Cakes. And I baked and baked for almost a year – 50 cakes later and a lot of learning landed me in the “better baker” category – one that does not freak out when the buttercream is separating during mixing or using the (still dreaded) piping bag to actually decorate something and make it “pretty”. With my new baking skills and experiences, I also gained tons of baking buddies. Sunday and Monday became my favorite days – I would sit and read how everyone fared with the designated cake of the week and soaked up the tips and tricks, the personal stories, and the wonderful creativity that this group was be willing to dish out. When the last cake was baked, I think everyone went into a bit of mourning – what were we to do? Some of us started other baking clubs but it was never quite the same. I believe that the level of complexity in Rose’s cake is what gave the bakers a challenge and thus the reason our recaps were always interesting because of the difficulty factor in the cake making and the successes and major fails that each of us experience. So, when Raymond, a past HCB and a present Gutsy Cook Club member, and I were reminiscing about this, the talk turned into cookbooks and we were very surprise how similar our taste in baking authors were. I happen to mention that I had gotten a new book from Karen Krasne – “Extraordinary Cakes” and that I was dying to dive into this world of more than 3 steps-needed-to-create-this cake recipes. Raymond, mention that Karen Krasne was a local chef and that he knew her and he also tastes some of these creations in her bakery he was more than willing to join me if I wanted. It took us two more emails before we had a list of cakes and a baking date for the first one. 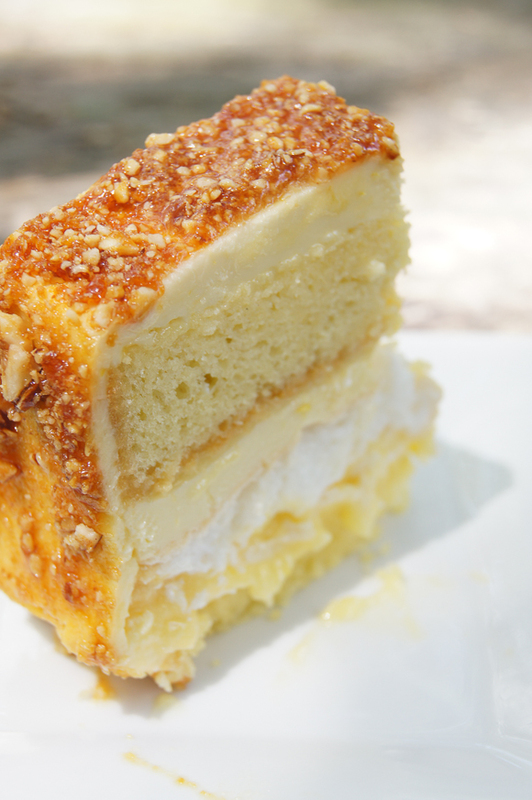 Behold the Lemon Praline Cake Torte. 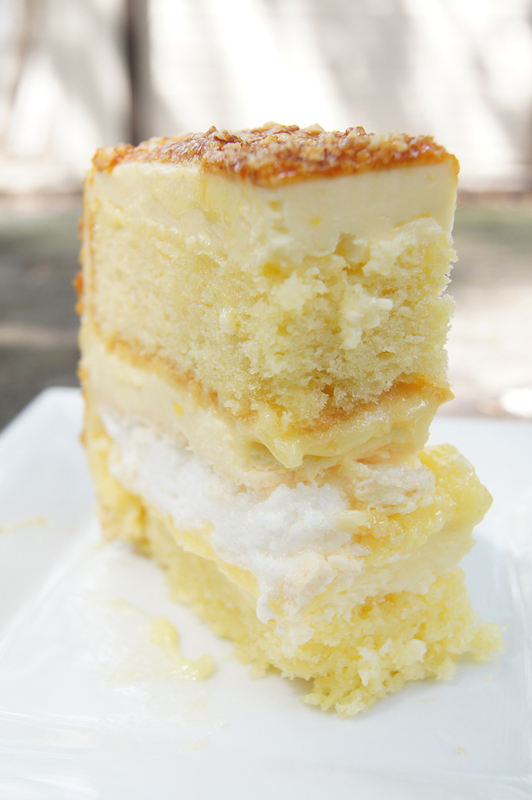 A torte made out of a sponge cake (Génoise) soaked with mild-tangy lemon syrup, covered in exquisite lemon buttercream and with a French meringue (think macaroon) center for a crunchy surprise. All of this encase in a hazelnut almond praline shell. 2 days of baking, and 8 steps later and I’m happy as a clam. My baking guru is jumping with joy. Sometimes you do need to make a complicated cake to be right with the world. Step 1: GENOISE - I had no issues with this step. The cake came together beautifully and instructions were clear and her timings were spot on “Whip the mixture on high speed until light in color and tripled in volume, 7 to 10 minutes” and in 7 minutes my batter was tripled and light in color! I love it when recipes do what they need to do. Step 2: LEMON SIMPLE SYRUP – None. Easy-peasy. Step 3: LEMON CURD – fasted lemon curd on the east coast! Having done this before in other recipes (I’m looking at you Lemon Canadian Crown) I prepared myself to be stirring over the stove for a longgggg time. Turns out that after about 4 minutes this was done and it was so delectable, I had to stop myself from licking the bowl, spoon and saucepan. I dreamed about it for 24 hours while it was in the refrigerator. Step 4: ITALIAN MERINGUE – Again, this was a revelation for me, I have done so many Italian Meringue and I always braced myself for “sure-to-happen” burn from the hot sugar syrup. But again, it all came together beautifully and on the noted time frame. High five to you Ms. Krasne! Step 5: LEMON BUTTERCREAM – Another hit. I always had issues with buttercreams, they are not my favorite “frosting” and I tend to give them the side eye, when I see a recipe that uses it. But this is the first ever buttercream that worked from beginning to end. I have no clue if past experiences had made me more in-tune with the butter being the right temperature, or the baking gods were aligned that day, but this buttercream rocked it – and the taste.. Ohhh the taste! Step 6: FRENCH MERINGUE – think of this as one giant French macaroon and you pretty much have this component down pack. 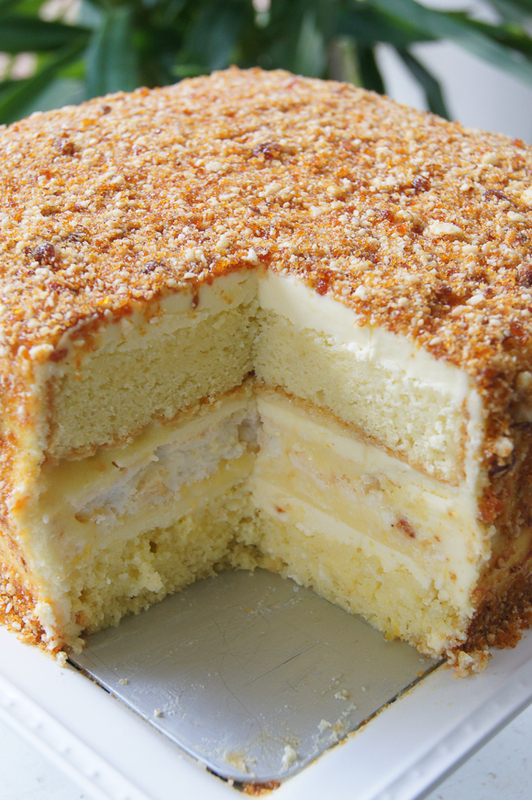 Crunchy on the outside, soft on the inside and all of this placed in the middle of the torte. Ohh, yes. And it was as easy as 1, 2, 3 to make. Step 7: HAZELNUT ALMOND PRALINE – to cover the cake. Unfortunately, this step I lost my mojo and let the sugar cook a bit too long and it turned bitter on me and by the time I realized it the toasted hazelnuts and almonds were in the hot sugar mixture and DO YOU KNOW HOW MUCH HAZELNUTS COST? Yeah, I thought you would agree with me. Next time, I need to really watch that sugar a bit more closely, because I totally love the idea of this covering on a cake. Step 8: ASSEMBLY – there is something to be said when cookbook author really think about how to convey steps in print. And I was very impress with the instructions; the assembly came together in a zilch and love, love the fact that the cake pan was used as the mold to build it upon. I’m totally in favor of this new learned technique of building the cake in the pan, and putting it in the freezer overnight for the whole thing to “set”. The end result is an easier cake to frost and decorate and a sure way to avoid a lopsided cake as well. So after all of this work, how did the cake taste? Raymond and I cannot wait to bake the next one on the list – The Ivoire Royale. Note: No recipes will be shared in my Extraordinary Cakes post, due to copyright restrictions with the publisher. I encourage you to support our author and buy the book here. To see our creations, we have a Pinterest board and Facebook group to share our experiences. If you happen to have the book and fancy joining us in our little pack, we are baking one cake a month, let me know via email.